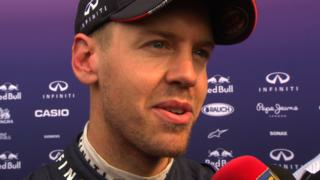 Reigning F1 champion Sebastian Vettel admits he is not where he "wants to be" after finishing fourth fastest in Friday's second practice session for the China Grand Prix. The Red Bull driver says the team had a good day but still have "a lot to do." Vettel's team-mate Daniel Ricciardo gives his thoughts on the challenging China circuit while Mercedes' Nico Rosberg looks forward to a "unique weekend."